If I knew definitively what the plural was for the term deus ex machina, I’d apply it here. Rarely can I remember a movie filled with so many miraculous rescues and associated contrivances. The Death Cure represents the final chapter in a movie series that made it to the finish line. That’s about the best thing that can be said about the three-film Maze Runner saga (unlike, for example, Divergent, which as a result of the dumb decision to bifurcate the final book, has left the conclusion untold). 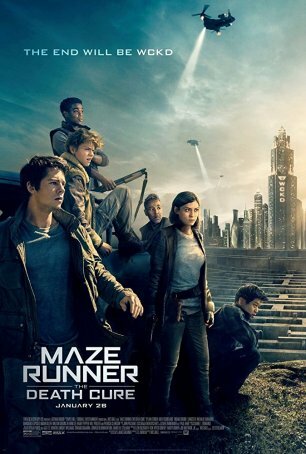 In the small world of cinematic dystopian YA serials, The Maze Runner has always seemed like an also-ran and it’s surprising that Fox decided to pony up the money for The Death Cure after the anemic performance of The Scorch Trials. After watching this overlong, bloated excuse for a climax, I can argue that the studio would have been better off pocketing the money and walking away. Fully three quarters of The Death Cure is an extended chase (with occasional breaks for exposition) in which our brooding hero, Thomas (Dylan O’Brien) and his faithful pal, Newt (Thomas Brodie-Sangster), seek to rescue their buddy, Minho (Ki Hong Lee), from the clutches of scientist Ava Paige (Patricia Clarkson), and her pet guard-dog, Janson (Aidan Gillen). Ava has been joined in the lab by Thomas’ love interest, Teresa (Kaya Scodelario), who betrayed all the good guys at the end of the second film. The rescue eats up an interminable amount of The Death Cure’s unnecessarily protracted running time and, after boring us to death, the story finally gets around to wrapping things up. Little about The Death Cure can be considered satisfying on any level. Canyon-sized plot holes remain, salvation frequently comes out of thin air, and character motivations become matters of narrative convenience. The script identifies a fascinating bio-ethical dilemma then quickly dispatches it by making it irrelevant. There are a few deaths but not as many as one would expect and several characters escape situations that should have had them strolling off alongside The Grim Reaper. Behind the scenes, Dylan O’Brien proved his dedication to his craft by sustaining a serious injury in a stunt-gone-wrong then returning to work as soon as he was healed. His performance, sadly, hasn’t improved since the previous film. The movie ignores the obvious chemistry between O’Brien and actress Rosa Salazar (who plays Brenda) by insisting that Thomas’ one true love is Teresa (played by a strangely robotic Kaya Scodelario, who seems to have given up on the series). The irony here is that, in James Dashner’s source novel, Thomas and Brenda fell in love, but the script decided not to incorporate this detail. Meanwhile, Aidan Gillen, who seems to have taken Littlefinger a little too much to heart, is good at being sneaky and conniving but isn’t sufficiently frightening to be The Big Bad Villain. The Death Cure is the worst of the three Maze Runner movies, although the drop-off from The Scorch Trials isn’t that steep. Director Wes Ball has displayed a strange consistency across the series. With the exception of the first half of The Maze Runner (which was actually quite good), the movies have been long, tedious, and rarely engaging. The action scenes have been poorly choreographed and chaotically presented. Picking through the debris, I can find one compliment – the movies are visually interesting. That’s something, I guess. The YA movie flame burned brightly for a few years before essentially being snuffed out by changing tastes (the genre, while not dead, has fallen back into the niche from whence it came) and Hollywood greed. By the time The Maze Runner got going, the downward trend was evident. The Death Cure will likely be the last YA book adaptation to make it to the screen and it already feels anachronistic – something that might have worked on some level four or five years ago but utterly fails in today’s climate. Pointless, loud, seemingly longer than a Peter Jackson film, and missing a credible story, The Death Cure is for Maze Runner completists only and even they will probably be disappointed (and perhaps horrified) by the divergence between the book and the movie.